You know when you've been cooking and the smell just lingers? Drives me mad! We have an extractor fan, but it's useless and the only thing which helps are expensive candles specifically designed to clear kitchen smells. 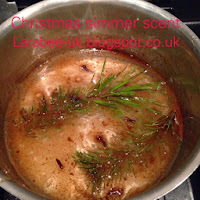 This week I tried a simmer scent on th hob to try and take away the smell, and I'm pretty sure that it worked! In fact, I could smell the sent of christmas the next day, before even warming it! I bunged it all in a pan after I'd finished cooking and brought to the boil, once boiling, I turned to a simmer and let simmer for about 30mins on a very low heat. It made the house smell lovely and Christmassy, and you can vary the scents that you put in, I wanted something really Christmassy, I wish that the pine smelled stronger but the cinnamon and cloves smelt so lovely and warming this didn't really matter too much, maybe adding more would help. This is such a great idea! Our house constantly stinks of sausages at the moment as they're the only food I can guarantee S will eat. Definitely trying this out to get rid of the smell!